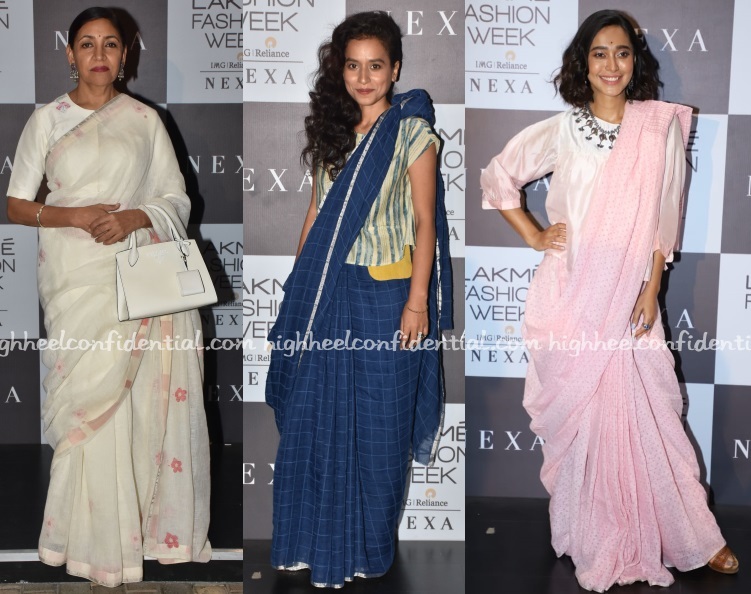 Wearing Anavila saris, each of them very differently, Deepti, Tillotama and Sayani attended the designer’s show on Friday evening. Ok so I’m really confused! Are you sure about Tillotama and Sayani? Whatever they are wearing is pure trash and you loved it? How can these 2 looks be okay when you were scratching you head on Kareena’s Denim look few posts ago? Oh love all 3. Each so pretty in their own ways. Omg I’m loving Tillotama here. Fun drape. Frizzy hairs. Deepti Ji is so gracefully beautiful. Deepti is elegant and understated. Sayani’s is a zany take and fun. Tilottama really does the quirk very well., I always like her style.